I want to go on the record here. This is what I just did this afternoon. Ok, that pic above not me, but it was Bananas and I and I think today we looked just like that! Ok, Coffeedoc said we were only going about 16 mph when I was on it, but I think he wasn’t paying attention. We musta hit 75 easy…. So, I know, I haven’t been on the tube all summer. I don’t know why. I forget how much fun it is to just be out there and watch the kids. I get caught up in the hassle of chores and such instead. Or, maybe it has been so smothering hot that I knew I would be crazy sick if I did go out there. But I promised and so today was the day, my daughter declared. It was really terrifying..um, exciting! 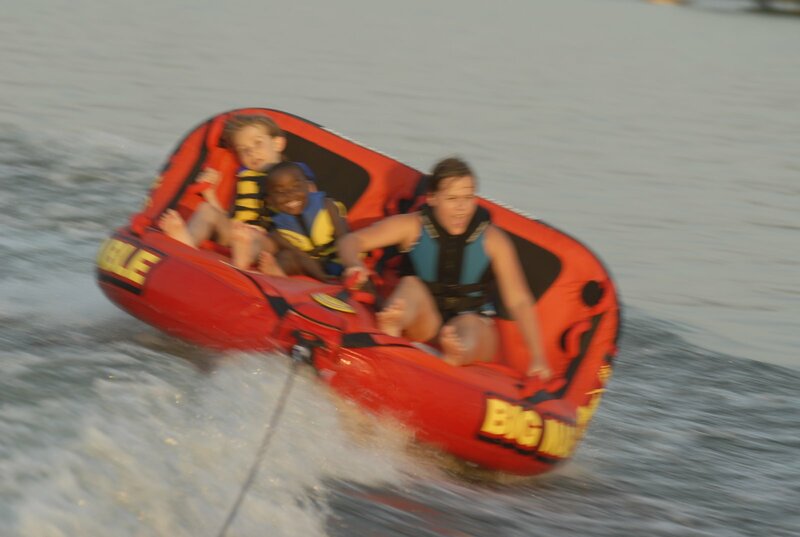 But it was baby Gabe’s first time on the boat. And my first time on the tube w/ Banana girl. And yeah, feeling a bit more cool…kinda, or not, I think they are still in awe..ok, laughing at me. But anyhow, I think we both are feeling pretty good about it. This entry was posted in family fun, family life by coffeemom. Bookmark the permalink. >Looks FUN!!! Yes you are cool :).